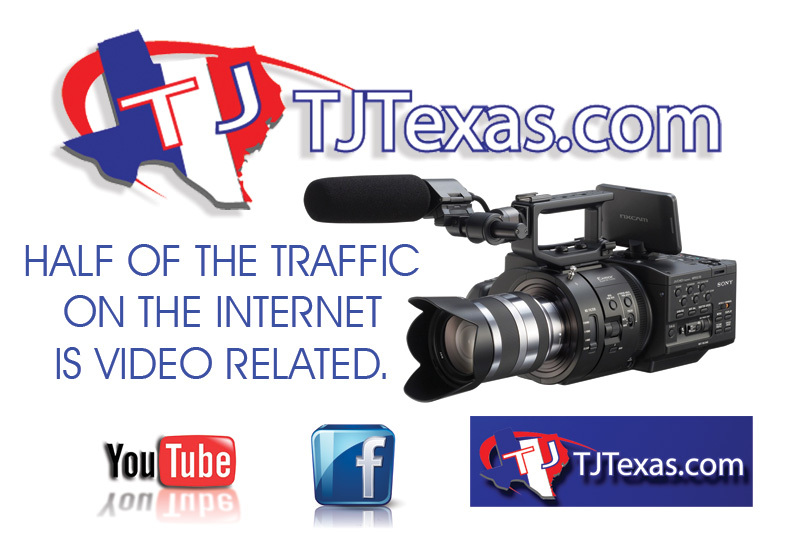 We love producing video marketing spots for our clients in the Greater Houston area and all over the World !! Video marketing is quickly taking over the internet. Half of the traffic on the internet today is video related. Once complete, you can run your video spot on your website, Facebook, Youtube... even Television. Many people are surprised to learn how reasonable advertising on Comcast can be. Enter your contact information or call us today! When businesses are looking to grow, the logical first step to initiate that growth is to increase marketing efforts. Traditional ways to market a business could be to place an ad in the newspaper or yellow pages, but those previously used methods are becoming less and less effective by the year. In a competitive market, a business needs to utilize tools that give it a competitive advantage. For a market such as Houston, video marketing provides that advantage. These are the top three reasons to make use of video marketing in Houston. The online video ad market grew at a 54% clip in 2012, surpassing all other formats. It’s not just video ads that are growing in popularity. Video as a whole is exploding online. In September of 2013, 46 billion content videos were watched online by 188.7 million people in the US alone. A Nielsen study showed that Youtube was more popular among adults aged 18-34 in the US than any cable network. People are getting more used to watching video online, and they are watching it more often. Businesses would be foolish to ignore the potential of video marketing methods, especially in large cities like New York, Los Angeles, and Houston where the competition is so fierce. The web analytics company comScore concluded that online visitors to a site stayed on that site two minutes longer if they watched a video than if they did not. That means they are actively engaged in the content of the site for 120 seconds longer than usual. What marketer wouldn’t love that? If your visitor has taken interest in your content, then they are much more likely to become a customer. Ultimately, the goal of a business is to convert their visitors to customers. With the engagement that video marketing provides, the job of converting the visitor is much easier. According to comScore, a visitor is 64% more likely to make a purchase of a product after they have watched a video of that product on the site. Online retail giant Zappos saw increases of up to 30% in sales for items that contained video. For a business that has a less mature online strategy than Zappos (which is basically everyone), those increases could be much higher. Implementing video marketing in Houston should be an easy decision. Over half of marketers say video marketing provides a better return on investment than all other forms of media marketing. With the competition for customers online becoming more stiff, those who ignore video marketing do so at their own peril. Enter your contact information and we will call you right away. If you really want your new online business or website to stand out above the rest, you want to hire a video marketing company that knows how to "Market With a Video" as well as being able to "Market A Video" Having someone in your corner who can do both can have a significant impact on your monthly traffic. Generally speaking, both services are typically operated and offered as separate online businesses by other video marketers. Over time, after providing both services, our experiences made us realize how much more powerful our video marketing tools could be if we combined both practices. What is really amazing is how much more traffic can be generated for any given website or online business with just a single video production. People are using Youtube like a search engine these days. They serve up 4 billion videos a day! By definition, video marketing is when messages and related media such as graphics or narratives are composed into video form to be used to communicate the benefits and potential of a specific website, or products and services offered by a specific business. About 84.1% of Internet users watch videos now, that's more than twice as many people who viewed them in 2005. Video marketing is a method of promoting your online business or website with a fresh video production. Very similar to television advertising, video marketing is no different than a TV commercial except that we create them for Internet users, they are a few minutes long as opposed to televisions 30, 60 or 90 second spots. Another difference is, once you pay for your video you own it. You will never have to pay a fee every time it's run or viewed by somebody. For the time being at least, using promotional videos and Internet marketing tools are by far the cheapest means of advertising your website, online business, or brick n' mortar business. Visual Art – typically expressed in a website as paintings and sculptures. Aural Art - typically expressed in a website as song and dance. Conceptual Art - typically expressed in a website as literature and poetry. The first television commercial went on the air in July of 1941. The Bulova watch company aired a commercial spot in between innings of the Dodgers and Phillies game. And millions of memeories have been created since. So in a way, video marketing is like the great-grand child of TV commercials. Whereas television made it possible for big companies to market their products and services, present-day online video marketing services make it more affordable for small businesses to promote their products and services as well. People tend to trust websites that have videos more. They believe if a person is willing to step in front of a camera to promote their businesses service or product, or even go so far as to demonstrate it, than that just makes the claims that much more believable. When a person steps in front of a camera they are in essence saying, “Here I am in the flesh...I'm not hiding behind a media veil of secrecy or unknowns...I'm revealing my real identity and staking my reputation on this product or service.” That goes a long way with most people. Our video marketing services use the power of the Internet and great video production to really get the business off on the right track and quickly. • We use our talents and experience to create just the right eye-catching graphics, titles and narratives to sell your product or service. • Videos are more apt to grab your visitors attention. And they do a better job at selling your product or service. • If it is Page Ranks and Search Engine Optimization your concerned with, you are 53 times more likely of getting a higher page rank with a video according to Forrester Research. • Video's increase your website’s conversion rates. • Video's can easily target specific audiences. • A good video production service can add luster to a company’s dull website. • An experienced video marketing service can do what content can't do with regards to branding and garnering customer loyalty. • A good video marketing company can help you market and sell your products in a much more convincing way than content alone.